The challenge of the gluten free diet when you want pizza! AAAs a doctor who treats many people with celiac disease and who is personally gluten sensitive, I am uniquely aware of the challenges of a gluten-free diet. I am also casein sensitive. So, pizza is something that has been missing from my diet for months. Those on a gluten-free diet can enjoy Amy’s gluten free pizza. 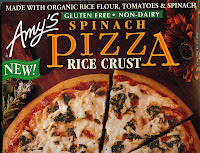 And if you are also avoiding casein, try Amy’s gluten-free dairy-free Spinach Pizza. This gluten-free, casein-free pizza has a rice crust and casein-free soy mozzarella and ricotta cheeses. Therefore, if you are sensitive or allergic to soy, you will want to avoid this pizza. Also, it is important to note that not all of Amy's products are gluten-free. So, you need to pay attention to the pizza boxes to confirm that they are gluten-free. The Spinach Pizza contains tomatoes, potatoes, sunflower seeds and rice. Spinach and organic sun-ripened tomatoes are combined with several herbs for a very tasty, yet gluten-free dairy-free pizza. There are no trans fats, preservatives or MSG. However, more than half the calories are from fat. So, just add gluten-free Red Bridge beer and you can enjoy a classic American meal and be somewhat unhealthy without eating gluten (or casein). I did on Super Bowl Sunday this year. I will tell you more about my thoughts on the new gluten-free beer Red Bridge in another post. Enjoy a gluten free food report written by a gluten free doctor! I hope you enjoy this new journal, the Gluten Free Food Report. In it I review gluten-free foods that I have personally tried. For those who want more scientific information with the Food Doc's insights on the latest research linking food and the gut to health, check out The Food Doc Journal. I also plan to publish a blog on probiotics. To your "healthy gut, healthy life". Copyright © 2007, The Food Doc, LLC, All Rights Reserved.